Today we will be making sequenced sounds in FM8. We will use looped envelopes to create rhythmic sequences and other tempo synced noises. Since every operator in FM8 can act as a separate audio output and also as a modulator one can create very complex sequences of inter-modulating rhythmic sounds. We will create syncopated background loops and some tempo synced effects. 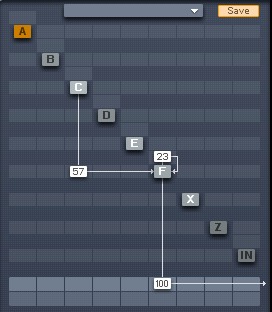 Each envelope in FM8 can be looped. The looping region is set by two vertical red lines found in every FM8 envelope. If you insert one or more breakpoints between the red markers the sustain segment becomes a loop. This means that this part will be repeated as long as the note is sustained. First we will create simple percussive loop. Draw four bars long note in your midi track. Try also adding few shorter notes on top of that, so you will have some pitch variations. I have also used simple kick drum as a rhythmic support. We will use E operator first this time since we will use F operator for bass later. Set operator’s E ratio to 6.000. Tempo sync the envelope and set it to loop the 3/8 region. You probably don’t see the grid in 1/8 of a bar resolution so click in the empty background of the envelope display and drag up or down to set the desired resolution. Here is a simple pattern that I’ve made. Turn on operator D. Set it’s ratio to 4. I have also looped it’s envelope to 3/8 region but with a different pattern. Set operator’s D audio output to 50. Let’s add a touch of reverb to it. Now we will create simple offbeat bass. Go to operator F page. Turn it’s audio output to 60 and it’s ratio to 2. Let’s add some modulator now. Activate operator C and set it’s ratio to 5. Loop it’s envelope over 4/8 of a bar. Try modulating operator F (our offbeat bass) with operator C. Set the modulation amount to 70. You will hear how the rhythmic pattern of operator C is affecting operator F.
Also activate X module, we will use some rhythmic noise to spice up our sound. Set it’s audio output to 70. Turn on operator B and set it’s ratio to 2 and loop region of the envelope to 2/8 of a bar. Turn modulation amount of operator B to operator E to 50. From here on there are no rules really. Just play with modulation amounts of operators, self-modulation and operator’s ratios and waveforms and apply unique settings for each morph corner. Here is a sample of morphing. Only kick drum and one instance of FM8, no other sounds are used. 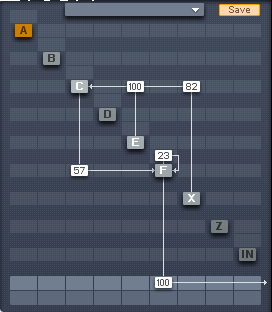 Try also changing ratios of operator to lower register, you can get some really cool bass sounds. Try modulating your perfectly timed bass sound with some heavily syncopated rhythms. This way you can add some cool variations and groove to your sounds. Here you can see and hear how I have morphed trough four variations of rhythmic modulations on a single bass sound. Everything can be connected and modulated so the rhythmic patterns affect other rhythmic patterns and you can get some amazing rhythms which are quite hard to get if you would be making each sound with a separate instrument. And the best thing is that sounds made with this technique can be easily kept in tight harmonic and rhythmic relationship. Here are some variations I’ve made. Only kick sample is used and one instance of FM8. Also be sure to use morphing capabilities of FM8. Change the waveforms, ratios, modulation amounts, audio output volumes and panning for each corner and then morph trough them on the fly. Another cool thing to do is to turn on key scaling or velocity scaling of the envelopes but just for one or two in your patch. Now the pitch or velocity of the note you play will affect the overall timing of the envelope. Great for song intros, transitional parts and breakdowns. Here is now this technique put in simple song context. I have used a kick drum, simple snare with offbeat hi hat loop and two instances of FM8 with variations of a patch we have made in this tutorial. One is used as bass sounds and another as all other higher sounds you hear. I have also used morph square to change the sound of both FM8 instances. No other automation or resampling were used. I strongly encourage you to do some experimenting since so much can be done with this technique. What did you think of this tutorial? Leave a comment!